The PFC-3000 series of ventilator testers measures flow, pressure, temperature, humidity and O2 concentrations bidirectionally. The one-of-a-kind adult, pediatric and high frequency ventilation measuring modes make the PFC-3000 the ideal calibration tool for all ventilators, anesthesia machines and spirometers. The PFC-3000 distinguishes itself from other calibration tools by combining a simple, intuitive multilingual user interface with the highest precision tester. With the push of a button, all measured values can be stored directly on the PFC-3000 and later retrieved for documentation purposes. 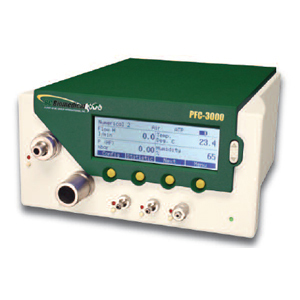 The Carefusion AVEA requires the PFC-3000L. View your flow, pressure and volume measurements comfortably on your computer monitor while simultaneously saving respiratory parameters. FlowLab allows you to view your measurement results graphically in real-time curves or numerically. Trending reports of up to 100 hours can be generated to verify long-term ventilator functionality. To facilitate your device management, test reports can also be created and saved electronically or printed. FlowLab software is available in 15 languages - more than any other measuring software! Data export to Excel, etc.